Somehow seeds often linger in the shadows of their larger nut cousins. As delicious and nutritious as nuts are, seeds are nutritional and flavor powerhouses that deserve attention. Seeds are rich in protein, dietary fiber, vitamins, minerals, fats and other nutrients. Here’s the lowdown on five seeds you may want to add to your pantry. Pumpkin: These versatile seeds are rich in zinc, which is beneficial for boosting the immune system and prostate health, making them an ideal guy snack. 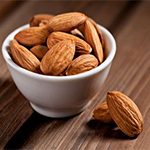 Nowadays you’ll find these nutritional gems in many prepared foods like breakfast bars and cereals, but be sure to keep plenty around to toss into salads and cereals and add to trail mix. Consider keeping a bag of toasted salted pumpkin seeds in the car for healthy snacking. Chia: Just two tablespoons of these tiny black or white seeds provide you with 10 grams of fiber, making them a great addition to daily smoothies. Chia seeds are also a good source of plant protein, with 1 ounce providing 4.4 grams of protein. Try soaking a tablespoon of chia seeds in a cup of fruit juice for a few hours; the seeds will soften and create a fun fiber-rich drink. Sunflower: The seeds from the beautiful sunflower are packed with vitamin E—a quarter cup supplies about two-thirds of your body’s daily vitamin E requirement. This essential vitamin serves as an antioxidant in your body, neutralizing free radicals associated with aging and cancer. Try using sunflower butter in place of peanut butter to up your intake. Flax: It’s high content of lignans, chemical plant compounds with estrogen-like and antioxidant properties, makes flax so healthy. Among a bevy of health benefits, these lignans may prevent breast and prostate cancer. One caveat with flax is that the seeds should be ground before consumption so they won’t pass through the digestive system whole. Poppy Seeds: These tiny black seeds do more than look pretty atop baked goods; they are rich in fiber and the minerals calcium and copper. Each two-tablespoon serving of poppy seeds provides you with 253 milligrams of calcium and 286 micrograms of copper. Try adding them to smoothies, hot and cold cereals and any savory dish.